I had a two for one deal on boyhood heroes at Trading Boundaries on the 12 of April. Not only did I see legendary guitarist Steve Howe but he was introduced to the stage by Roger Dean. 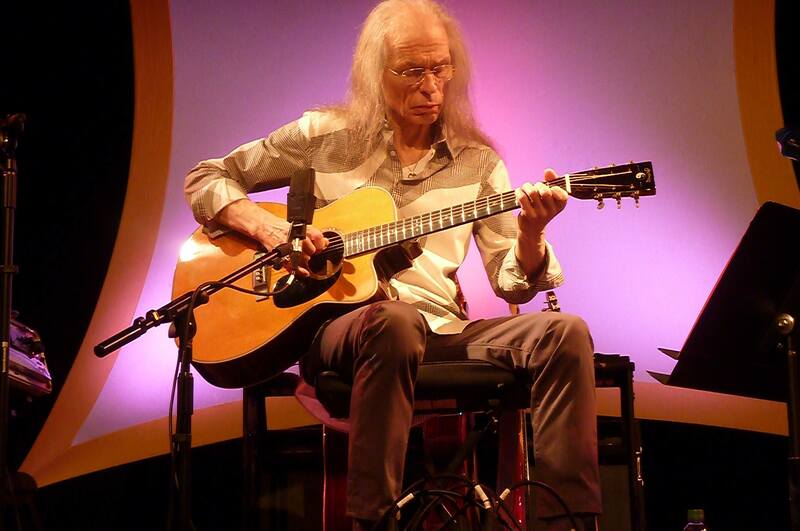 Steve Howe is a fabulous guitarist. His self-taught mastery of musical genres from classical to country blues, plus an extraordinary musical imagination, means he has always been my benchmark when listening to guitarists in any genre. At Trading Boundaries I found his performance uplifting. I’d first seen him live in 1975, and several times since then, but not for perhaps ten years. For me it was heartening to see my boyhood hero, guitarist of Yes, in such an intimate and pleasant venue. He was relaxed, chatty and still playing exquisitely after all these years. Then there’s Roger Dean. As a teenager I loved Dean’s fantastic landscapes and Dean’s Views was the first book by an artist I felt I could personally relate to. He also made me imagine what life in one of his organically-rounded dwellings might be like, opened me up to the possibilities of set design, and gave me a glimpse at the trial and error that went into the creation of a logo. Thanks to my mother, I was taken to galleries from an early age and by the time I did an A Level in art I was more German Neue Sachlichkeit than fantasy art. But to this day I have a Roger Dean poster in my study and his work is always something I have in mind, say when at the recent Peder Balke exhibition in the National. The work of Howe playing with Yes and Roger Dean combined to form a sonic and visual environment that was a teenage refuge, a niche in the imagination that belonged to me. For that I am still grateful. This entry was posted in Art, Design, Music and tagged Roger Dean, Steve Howe, Trading Boundaries, Yes. Bookmark the permalink.